Saeed al Ghamdi was one of the so-called “muscle hijackers” of United Airlines Flight 93, crashed into an empty field in Shanksville, Pennsylvania, but intended to be flown into the Capitol or White House as the fourth of the four 9/11 plane hijackings.National Commission on Terrorist Attacks upon the United States, Thomas H. Kean, and Lee Hamilton. 2004. The 9/11 Commission report: final report of the National Commission on Terrorist Attacks upon the United States. (Washington, D.C.): 14; 231; 435, http://govinfo.library.unt.edu/911/report/911Report.pdf. As a muscle hijacker, Ghamdi helped to storm the cockpit and keep passengers under controlNational Commission on Terrorist Attacks upon the United States, Thomas H. Kean, and Lee Hamilton. 2004. The 9/11 Commission report: final report of the National Commission on Terrorist Attacks upon the United States. (Washington, D.C.): 227, http://govinfo.library.unt.edu/911/report/911Report.pdf. so that the hijacker-pilot, Ziad Jarrah, could enter the cockpit and take control of the plane. The flight’s four hijackers reportedly used knives and the threat of a bomb to carry out the hijacking, forcing passengers to the back of the aircraft and killing at least two members of the flight crew.National Commission on Terrorist Attacks upon the United States, Thomas H. Kean, and Lee Hamilton. 2004. The 9/11 Commission report: final report of the National Commission on Terrorist Attacks upon the United States. (Washington, D.C.): 13, http://govinfo.library.unt.edu/911/report/911Report.pdf. However, because of a passenger revolt, the hijackers were ultimately unable to crash the plane into their intended target and instead drove it into the ground approximately 20 minutes outside of Washington, D.C., in an empty field in Shanksville, Pennsylvania.National Commission on Terrorist Attacks upon the United States, Thomas H. Kean, and Lee Hamilton. 2004. The 9/11 Commission report: final report of the National Commission on Terrorist Attacks upon the United States. (Washington, D.C.): 14, http://govinfo.library.unt.edu/911/report/911Report.pdf. Adam Weinstein, “The Real Largest State Sponsor of Terrorism,” Huffington Post, March 16, 2017, http://www.huffingtonpost.com/entry/the-real-largest-state-sponsor-of-terrorism_us_58cafc26e4b00705db4da8aa. While in al-Qassim, Ghamdi reportedly dropped out of school without informing his family,National Commission on Terrorist Attacks upon the United States, Thomas H. Kean, and Lee Hamilton. 2004. The 9/11 Commission report: final report of the National Commission on Terrorist Attacks upon the United States. (Washington, D.C.): 233, http://govinfo.library.unt.edu/911/report/911Report.pdf. later contacting them in December 1999 to tell them that he was leaving to wage violent jihad against Russian forces in Chechnya.National Security Archive, “The Plot and the Plotters,” Central Intelligence Agency Intelligence Report, June 1, 2003, 47, https://assets.documentcloud.org/documents/368989/2003-06-01-11-september-the-plot-and-the.pdf. The 9/11 Commission confirms that Ghamdi was one of only two 9/11 muscle hijackers who actually had documentation suggesting that he may have traveled to Russia.National Commission on Terrorist Attacks upon the United States, Thomas H. Kean, and Lee Hamilton. 2004. The 9/11 Commission report: final report of the National Commission on Terrorist Attacks upon the United States. (Washington, D.C.): 233, http://govinfo.library.unt.edu/911/report/911Report.pdf. Many of the 9/11 hijackers were instead diverted to Afghanistan, where they volunteered to be suicide attackers after hearing Osama Bin Laden’s speeches.National Commission on Terrorist Attacks upon the United States, Thomas H. Kean, and Lee Hamilton. 2004. The 9/11 Commission report: final report of the National Commission on Terrorist Attacks upon the United States. (Washington, D.C.): 233, http://govinfo.library.unt.edu/911/report/911Report.pdf. This was likely the case for Ghamdi, who reportedly met 9/11 architect Khalid Sheikh Mohammed (KSM) when he was working in security at the airport in Kandahar, Afghanistan. KSM claims to have become close acquaintances with Ghamdi, encouraging him—and ultimately convincing him—to become a suicide attacker. Saeed al Ghamdi himself then allegedly recruited Ahmed al Ghamdi, a friend from Saudi Arabia and another future 9/11 hijacker.National Commission on Terrorist Attacks upon the United States, Thomas H. Kean, and Lee Hamilton. 2004. The 9/11 Commission report: final report of the National Commission on Terrorist Attacks upon the United States. (Washington, D.C.): 233-34, http://govinfo.library.unt.edu/911/report/911Report.pdf. The hijackers underwent basic training in weaponry use at al-Faruq, an al-Qaeda training camp near Kandahar. All of the hijackers volunteered for suicide missions.National Commission on Terrorist Attacks upon the United States, Thomas H. Kean, and Lee Hamilton. 2004. The 9/11 Commission report: final report of the National Commission on Terrorist Attacks upon the United States. (Washington, D.C.): 234, http://govinfo.library.unt.edu/911/report/911Report.pdf. After completing their basic training sometime in 2000, the muscle hijackers were instructed to return to their home countries and acquire new passports and U.S. visas.National Commission on Terrorist Attacks upon the United States, Thomas H. Kean, and Lee Hamilton. 2004. The 9/11 Commission report: final report of the National Commission on Terrorist Attacks upon the United States. (Washington, D.C.): 234-5, http://govinfo.library.unt.edu/911/report/911Report.pdf. Ghamdi received a U.S. visa in Saudi Arabia on September 4, 2000.National Commission on Terrorist Attacks upon the United States, Thomas H. Kean, and Lee Hamilton. 2004. The 9/11 Commission report: final report of the National Commission on Terrorist Attacks upon the United States. (Washington, D.C.): 525, http://govinfo.library.unt.edu/911/report/911Report.pdf. However, for an unspecified reason, he received a second U.S. visa on June 12, 2001, using a new passport to apply. As al-Qaeda was known to doctor passports,National Commission on Terrorist Attacks upon the United States, Thomas H. Kean, and Lee Hamilton. 2004. The 9/11 Commission report: final report of the National Commission on Terrorist Attacks upon the United States. (Washington, D.C.): 563-4, http://govinfo.library.unt.edu/911/report/911Report.pdf. the 9/11 Commission suggests that his original passport may have been damaged in the process, prompting him to obtain a second passport.National Commission on Terrorist Attacks upon the United States, Thomas H. Kean, and Lee Hamilton. 2004. The 9/11 Commission report: final report of the National Commission on Terrorist Attacks upon the United States. (Washington, D.C.): 525, http://govinfo.library.unt.edu/911/report/911Report.pdf. In the two years before his arrival in the United States, Ghamdi is believed to have traveled to various places in addition to Afghanistan, including Moldova, Bahrain, Lebanon, Qatar, Pakistan, and the United Arab Emirates, although the purpose of these travels is unknown.National Security Archive, “The Plot and the Plotters,” Central Intelligence Agency Intelligence Report, June 1, 2003, 47, https://assets.documentcloud.org/documents/368989/2003-06-01-11-september-the-plot-and-the.pdf. The so-called “muscle hijackers” all returned to Afghanistan for special training in late 2000 or early 2001, where they learned to conduct hijackings.National Commission on Terrorist Attacks upon the United States, Thomas H. Kean, and Lee Hamilton. 2004. The 9/11 Commission report: final report of the National Commission on Terrorist Attacks upon the United States. (Washington, D.C.): 235-6, http://govinfo.library.unt.edu/911/report/911Report.pdf. All of the muscle hijackers were personally chosen by bin Laden during this time, after which point they committed to carrying out a suicide operation and filmed a so-called “martyrdom video.”National Commission on Terrorist Attacks upon the United States, Thomas H. Kean, and Lee Hamilton. 2004. The 9/11 Commission report: final report of the National Commission on Terrorist Attacks upon the United States. (Washington, D.C.): 235, http://govinfo.library.unt.edu/911/report/911Report.pdf. The video featuring Saeed al Ghamdi was released in September of 2003.“Aljazeera airs 9/11 hijacker tape,” Al Jazeera, September 12, 2003, http://www.aljazeera.com/archive/2003/09/200849152746318218.html. Saeed al Ghamdi arrived in the United States on June 27, 2001. He flew from Dubai to Florida, via London, alongside another 9/11 muscle hijacker, Fayez Banihammad. 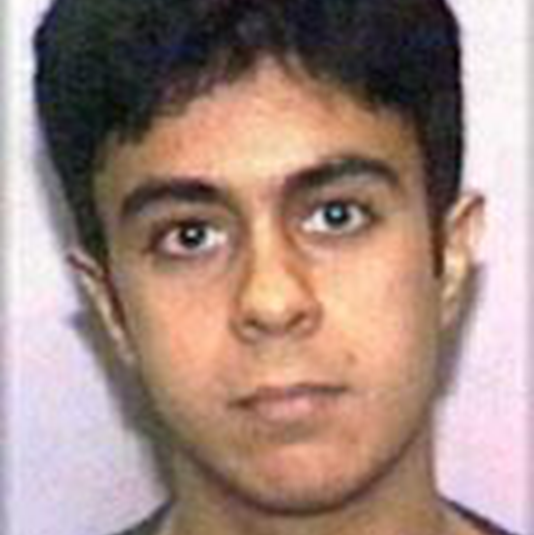 Upon his arrival in Orlando, Ghamdi was questioned by immigration authorities who suspected that he intended to overstay his visa, since he fit the profile, speaking little English, with no return ticket and no address listed for where he planned to stay upon his arrival.National Commission on Terrorist Attacks upon the United States, Thomas H. Kean, and Lee Hamilton. 2004. The 9/11 Commission report: final report of the National Commission on Terrorist Attacks upon the United States. (Washington, D.C.): 528, http://govinfo.library.unt.edu/911/report/911Report.pdf. Ghamdi ultimately lived with other hijackers at a variety of motels and apartments in southern Florida in the subsequent months.“9/11 Chronology Part 01 of 02,” Federal Bureau of Investigation, accessed July 7, 2017, 54, 87, https://vault.fbi.gov/9-11%20Commission%20Report/9-11-chronology-part-01-of-02/. Records show that he opened a bank account,“9/11 Chronology Part 02 of 02,” Federal Bureau of Investigation, accessed July 7, 2017, 184, https://vault.fbi.gov/9-11%20Commission%20Report/9-11-chronology-part-02-of-02/. obtained a Florida state identification card,“9/11 Chronology Part 02 of 02,” Federal Bureau of Investigation, accessed July 7, 2017, 183, https://vault.fbi.gov/9-11%20Commission%20Report/9-11-chronology-part-02-of-02/. and even joined a gym.“9/11 Chronology Part 02 of 02,” Federal Bureau of Investigation, accessed July 7, 2017, 180, 182, https://vault.fbi.gov/9-11%20Commission%20Report/9-11-chronology-part-02-of-02/. Saeed al Ghamdi called United Airlines on September 5 and purchased two airline tickets on United Airlines Flight 93, bound from Newark to San Francisco, for himself and fellow muscle hijacker Ahmed al Nami.“9/11 Chronology Part 02 of 02,” Federal Bureau of Investigation, accessed July 7, 2017, 257, https://vault.fbi.gov/9-11%20Commission%20Report/9-11-chronology-part-02-of-02/. Two days later, on September 7, Ghamdi and Nami flew from Ft. Lauderdale to Newark via Atlanta.“9/11 Chronology Part 02 of 02,” Federal Bureau of Investigation, accessed July 7, 2017, 261, 264, https://vault.fbi.gov/9-11%20Commission%20Report/9-11-chronology-part-02-of-02/. On September 8, they checked into the Marriott Hotel at Newark International Airport.“9/11 Chronology Part 02 of 02,” Federal Bureau of Investigation, accessed July 7, 2017, 270, https://vault.fbi.gov/9-11%20Commission%20Report/9-11-chronology-part-02-of-02/. Although United Airlines Flight 93 would depart from Newark on September 11, there are reports of him possibly being sighted with 9/11 hijackers Hamza al Ghamdi and Ahmed al Ghamdi at a motel in Boston on September 10.“9/11 Chronology Part 02 of 02,” Federal Bureau of Investigation, accessed July 7, 2017, 280, https://vault.fbi.gov/9-11%20Commission%20Report/9-11-chronology-part-02-of-02/. On the morning of September 11, 2001, Saeed al Ghamdi and the three other hijackers of United Airlines Flight 93 checked in at Newark International Airport between 7:03 and 7:39 a.m. They passed through security without issue, all boarding the plane by 7:48 a.m. flight from Newark to California. Ghamdi sat in seat 3D, in the first-class cabin.National Commission on Terrorist Attacks upon the United States, Thomas H. Kean, and Lee Hamilton. 2004. The 9/11 Commission report: final report of the National Commission on Terrorist Attacks upon the United States. (Washington, D.C.): 4, http://govinfo.library.unt.edu/911/report/911Report.pdf. United Airlines Flight 93 was scheduled to depart at 8:00 a.m., but did not take off until 8:42 a.m.National Commission on Terrorist Attacks upon the United States, Thomas H. Kean, and Lee Hamilton. 2004. The 9/11 Commission report: final report of the National Commission on Terrorist Attacks upon the United States. (Washington, D.C.): 10, http://govinfo.library.unt.edu/911/report/911Report.pdf. At this point, American Airlines Flight 11 had already been hijacked, but the pilots of United Flight 93 did not receive a warning about the possibility of a cockpit intrusion until 9:24 a.m.National Commission on Terrorist Attacks upon the United States, Thomas H. Kean, and Lee Hamilton. 2004. The 9/11 Commission report: final report of the National Commission on Terrorist Attacks upon the United States. (Washington, D.C.): 10-11, http://govinfo.library.unt.edu/911/report/911Report.pdf. The plane hijacking on United Airlines Flight 93 began at 9:28 a.m.National Commission on Terrorist Attacks upon the United States, Thomas H. Kean, and Lee Hamilton. 2004. The 9/11 Commission report: final report of the National Commission on Terrorist Attacks upon the United States. (Washington, D.C.): 12, http://govinfo.library.unt.edu/911/report/911Report.pdf. According to reports from passengers and crew members who made calls before the plane crashed, the hijackers, who wore red bandanas, used knives and the threat of a bomb to carry out the hijacking. They killed at least two members of the flight crew and forced the passengers to move to the back of the plane so that the hijacker-pilot, Ziad Jarrah, could take control of the aircraft. However, passengers making calls were able to learn about the other hijackings, and decided to stage a revolt. At 9:57 a.m., they launched a sustained assault on the cockpit in an attempt to retake the plane from the terrorists.National Commission on Terrorist Attacks upon the United States, Thomas H. Kean, and Lee Hamilton. 2004. The 9/11 Commission report: final report of the National Commission on Terrorist Attacks upon the United States. (Washington, D.C.): 13, http://govinfo.library.unt.edu/911/report/911Report.pdf. The struggle in the cockpit could be heard over radio transmissions. At 10:02 a.m., likely judging that the passengers would soon overtake them, the hijackers in the cockpit decided to crash the plane short of their intended target of either the Capitol or the White House. United Airlines Flight 93 crashed into an empty field in Shanksville, Pennsylvania, at 10:03 a.m.,National Commission on Terrorist Attacks upon the United States, Thomas H. Kean, and Lee Hamilton. 2004. The 9/11 Commission report: final report of the National Commission on Terrorist Attacks upon the United States. (Washington, D.C.): 14, 33, http://govinfo.library.unt.edu/911/report/911Report.pdf. killing all 44 people on board.Sara Rimer, “A NATION CHALLENGED: THE PENNSYLVANIA CRASH; 44 Victims Are Remembered, and Lauded,” New York Times, September 18, 2001, http://www.nytimes.com/2001/09/18/us/a-nation-challenged-the-pennsylvania-crash-44-victims-are-remembered-and-lauded.html. The 9/11 attacks—including attacks on the World Trade Center, the Pentagon, and the thwarted attack headed for the White House or Capitol—left nearly 3,000 people dead in the single deadliest attack in U.S. history.National Commission on Terrorist Attacks upon the United States, Thomas H. Kean, and Lee Hamilton. 2004. The 9/11 Commission report: final report of the National Commission on Terrorist Attacks upon the United States. (Washington, D.C.): 7, http://govinfo.library.unt.edu/911/report/911Report.pdf. Sa’id ‘Abdallah Ali Salman al-Ghamdi“The Plot and the Plotters,” National Security Archive, June 1, 2003, 47, https://assets.documentcloud.org/documents/368989/2003-06-01-11-september-the-plot-and-the.pdf. Sa’id al-Ghamdi“The Plot and the Plotters,” National Security Archive, June 1, 2003, 28, https://assets.documentcloud.org/documents/368989/2003-06-01-11-september-the-plot-and-the.pdf. Sadeed Abdullah Alghamdi“9/11 Chronology Part 02 of 02,” Federal Bureau of Investigation, accessed July 13, 2017, 180, https://vault.fbi.gov/9-11%20Commission%20Report/9-11-chronology-part-02-of-02/. Saeed A. A. A. Al Ghamdi“Hijacker True Name Usage Chart for 2001,” United States District Court Eastern District of Virginia, accessed July 10, 2017, 9, http://www.vaed.uscourts.gov/notablecases/moussaoui/exhibits/prosecution/OG00013.pdf. Saeed A. A. A. Al-ghamdi“Hijacker True Name Usage Chart for 2001,” United States District Court Eastern District of Virginia, accessed July 10, 2017, 9, http://www.vaed.uscourts.gov/notablecases/moussaoui/exhibits/prosecution/OG00013.pdf. Saeed A. Al Ghamdi“Hijacker True Name Usage Chart for 2001,” United States District Court Eastern District of Virginia, accessed July 10, 2017, 9, http://www.vaed.uscourts.gov/notablecases/moussaoui/exhibits/prosecution/OG00013.pdf. Saeed Abdullah Al Ghandi“Hijacker True Name Usage Chart for 2001,” United States District Court Eastern District of Virginia, accessed July 10, 2017, 25, http://www.vaed.uscourts.gov/notablecases/moussaoui/exhibits/prosecution/OG00013.pdf. Saeed Abdullah Alghamdi“9/11 Chronology Part 02 of 02,” Federal Bureau of Investigation, accessed July 13, 2017, 180, https://vault.fbi.gov/9-11%20Commission%20Report/9-11-chronology-part-02-of-02/. Saeed Al Ssalman“Hijacker True Name Usage Chart for 2001,” United States District Court Eastern District of Virginia, accessed July 10, 2017, 25, http://www.vaed.uscourts.gov/notablecases/moussaoui/exhibits/prosecution/OG00013.pdf. Saeed al-Ghamdi“Hijacker True Name Usage Chart for 2001,” United States District Court Eastern District of Virginia, accessed July 10, 2017, 9, http://www.vaed.uscourts.gov/notablecases/moussaoui/exhibits/prosecution/OG00013.pdf. Saeed AlGamdi“Hijacker True Name Usage Chart for 2001,” United States District Court Eastern District of Virginia, accessed July 10, 2017, 29, http://www.vaed.uscourts.gov/notablecases/moussaoui/exhibits/prosecution/OG00013.pdf. Saeed Alghandi“Hijacker True Name Usage Chart for 2001,” accessed July 10, 2017, 25, http://www.vaed.uscourts.gov/notablecases/moussaoui/exhibits/prosecution/OG00013.pdf. Saeed Alghamdi“Hijacker True Name Usage Chart for 2001,” United States District Court Eastern District of Virginia, accessed July 10, 2017, 9, http://www.vaed.uscourts.gov/notablecases/moussaoui/exhibits/prosecution/OG00013.pdf. Saeed Ghamdi“Hijacker True Name Usage Chart for 2001,” United States District Court Eastern District of Virginia, accessed July 10, 2017, 12, http://www.vaed.uscourts.gov/notablecases/moussaoui/exhibits/prosecution/OG00013.pdf. Said al-Ghamidi“Aljazeera airs 9/11 hijacker tape,” Al Jazeera, September 12, 2003, http://www.aljazeera.com/archive/2003/09/200849152746318218.html. Saeed al Ghamdi was one of the so-called “muscle hijackers” of United Airlines Flight 93, crashed into an empty field in Shanksville, Pennsylvania, but intended to be flown into the Capitol or White House as the fourth of the four 9/11 plane hijackings. “America is the enemy that every Muslim should fight. There is no way the Arab nation can be saved except through jihad.”“Aljazeera airs 9/11 hijacker tape,” Al Jazeera, September 12, 2003, http://www.aljazeera.com/archive/2003/09/200849152746318218.html.